​AUSTIN - ​Three local developers have teamed with Austin-based Cypress Real Estate Advisors to build apartments, luxury townhomes and an office building at Walsh Tarlton Lane and Loop 360. The 16-acre site sits across from Barton Creek Square mall and formerly housed a Cinemark theater. Katie Daly of Cypress Real Estate said that the site has presented development challenges, with its mix of three uses and strict development regulations due to its location in an environmentally sensitive area. ​The first component of the project is scheduled to break ground this month, when Centro Development starts construction on 168 apartment units and 21 townhomes. 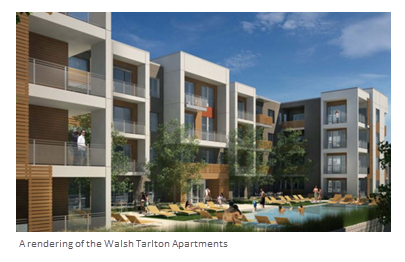 Tentatively called Walsh Tarlton Apartments, the first units are expected to be ready by late summer of 2017. Rents are expected to range from $1,500 a month to $2,400 a month, while rents for the townhomes are projected to range from $2,800 to $3,500 a month. In addition to Centro's housing, Chupik Properties and Design is partnering with Prominence Homes to build 55 luxury townhomes on the site. 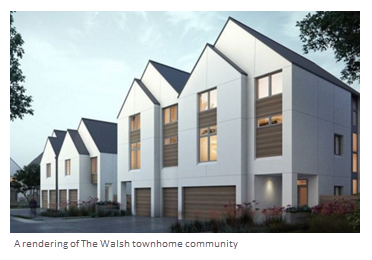 Construction on the townhomes, which will collectively be called The Walsh, is due to start next month, with a fall 2016 opening planned. Prices are expected start in the $600,000s. This summer, JTM Development will break ground on Walsh Tarlton Overlook, a three-story, 55,000-sf office building. The building is expected to be completed in 2017. Each project will be developed under a separate partnership with Cypress, which purchased the site in 2007 and won approval from the Austin City Council to rezone the property for a mixed-use development in 2011.